When I published the Polygon Map Generation article in 2010, I wasn't expecting it to get as much attention as it did. It's now one of the more popular pages on my site. I also got lots of feedback and feature requests. I decided to implement a few of the easier features. 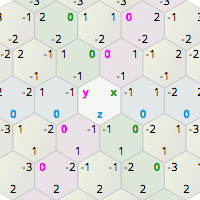 After finishing the hex guide and then playing with emscripten I decided to collect all the techniques I used for html5 visualizations. I wanted to see what there was in common among the articles I had written so that I could turn it into a library that I could use for future articles. Unfortunately there wasn’t much. That left me a bit disappointed. I also tried to solve some performance woes with my hex guide when viewed on an iPad. I got some improvement but not as much as I had hoped. That also left me disappointed. I’m also finding myself spending more of my time helping people privately, over email, and am trying to decide how much time to spend there. I’d rather be helping thousands of people with an article than helping one person with an email, but maybe I can turn some of the emails into short articles, less polished than the ones I’ve been writing. When I was a kid I spent most of my time on schoolwork. I seemed to learn slower than my friends did, so I was the one reading and re-reading the book while they were out playing. I learned to value 16 weeks of summer break and 3 weeks of winter break as the times when I could learn new things in unstructured time, with no expectation of doing something useful. So I thought back on those times as a kid when I just learned something without a specific goal in mind, and decided to take a break from writing articles for the rest of the summer. I pulled out my list of things I’ve always been curious about, and decided to study sound & music. 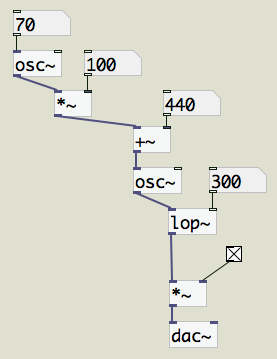 That’s a pretty big area, so I explored a little bit and ended up looking at digital audio signal processing. I’m reading David Cottle’s tutorial to learn about procedurally generated music. I’m also reading Andy Farnell’s Designing Sound to learn about procedurally generated sound effects. I’m also reading Steven W. Smith’s The Scientist and Engineer’s Guide to Digital Signal Processing to understand the math and algorithms. It’s not as compact (especially every add and multiply having to be a box with connections) but you can click on numbers and change them easily. That makes it easier to explore the space of values; the space of structures is still inconvenient to explore. My programmer background makes me lean towards SuperCollider, which is why I’m trying to spend more time in Pure Data to learn a different way of approaching problems. Will I do anything with this? I don’t know. It doesn’t matter. I’m just learning it because it’s interesting! I love city building and transportation games, and ever since I worked on one, I’ve had a side interest in how to represent and draw roads and railroad tracks. After playing lots of Cities XL, I started to wonder how I’d represent curved roads.